Every tech company wants to hire great software developers. But competing for talented people is difficult – especially in this economy. At The Software House, we’ve managed to grow steadily to over 130 specialists in just a few years. We’re not quite on par with Google when it comes to recruitment capability, but we can definitely say that our approach to hiring and keeping great developers proved successful. Would you like to know how we’ve managed to do that? Well, keep on reading. Who is a great developer, actually? To us, a great developer is a person who has all the programming skills and the necessary soft skills to thrive in the kind of environment we’re trying to create. That’s because not only do we need people to have programming expertise, but they also have to be willing to share their knowledge and help others grow as developers. Since our main job is to solve business problems of our clients, they also need to be able to talk to clients – including those who are non-technical – empathize with them and understand their business needs. To make it happen in practice, a decent command of English is also necessary – it’s another factor we pay attention to. Many of these soft skills can be taught, but the right attitude from the developers themselves is necessary. When it’s there, such developers are true growth-drivers in and of itself – they are a pleasure to work with, they bring new developers on board (because they have a vast network of skilled friends) and contribute to a healthy, fun and safe-to-fail environment. dedicated training budget for each employee. But all these points are quite obvious and are standard industry practices. Following standards is not enough to communicate that we are indeed a developer-friendly company, or even just to stand out in the crowd. A lot more has to be done. For us that means various initiatives. 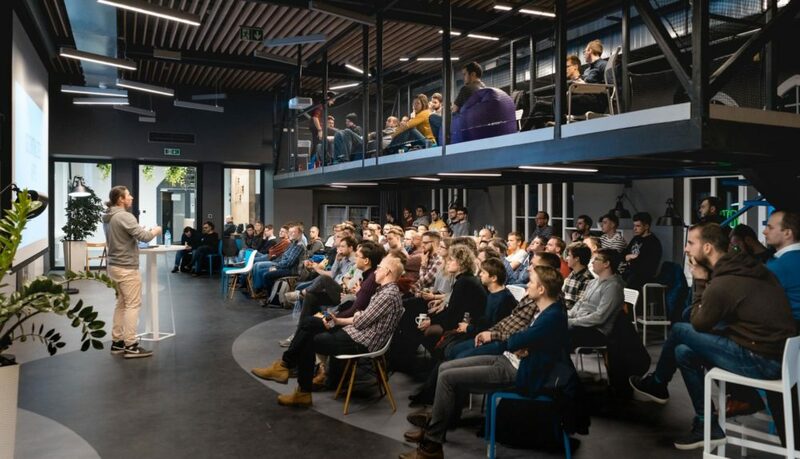 As early as in 2015, we created Uszanowanko Programowanko – a meetup for developers held every month in our city (Gliwice). Over time, it has become one of the biggest events of its kind in Poland. At the time of writing this article, it has been held 36 times, gathering a community of 2,000 people on meetup.com as well as over 150 attendees every meeting. The meetup is not only a way for us to give back to the community, but also for our developers to share and improve their knowledge. The recognition The Software House receives for organising a popular meetup goes a long way to position us as a company where developers play a central role. It draws the attention of many great candidates. Our efforts to share knowledge and give back to the community, drawing attention to the quality of our work and our values, aren’t limited to the meetup. They are expressed in many forms. One of them is a series of technical online webinars for developers and tech managers. A total of 5 editions that have taken place so far attracted close to 1,500 signups. The latest one, concerning Microservices in Node.js, alone brought almost 500 signups of developers located in Poland. By showing our skills, we were able to draw the attention of a few hundred potentially interested in working at The Software House (either now or sometime in the future). An important part of it is also participation of our developers in a number of conferences in Poland and abroad, as both speakers and participants. 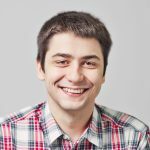 Just to mention the latest events, TSH developers spoke at SymfonyCon and Dutch PHP (see our developers Tomasz Kajtoch and Szymon Szymański on the speaker list). But the choice is only limited by the creativity and passion of our employees. Now, a story that may be somehow surprising. Why has the decision to move our headquarters to the popular Old Office in Gliwice been so important for our employer branding efforts? 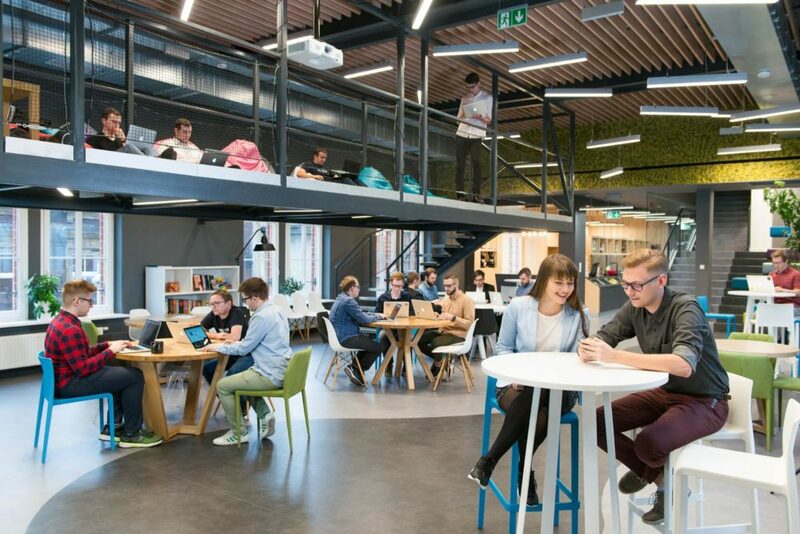 Firstly, we’ve greatly improved working conditions for all of our employees – a total of 1600 square meters means that everyone gets as much space as they need. Our brand recognition greatly improved too, due to heavy media coverage of our move as well as a shower of awards we received for the design of our new office. But, most importantly, we have become the true center of activity for the local community of developers. With great headquarters, we can organize bigger events, and have a much bigger overall impact on the community. If we like a CV, it is followed by a quick test assignment. The result is verified by a head of department. If it’s good, the developer is invited to an interview. This eye-to-eye meeting is also meant to find out if the candidate has the needed soft skills, such as the ability to think of the business aspects of the code they create, being able to explain their choices in an easy and concise manner, etc. The decision is made by those who participated in this particular recruitment process, not by some distant department. If the candidate gets the job we start with a two-week bootcamp introducing new employees to the life and practices at The Software House, followed by work on some internal projects of ours. And what about those who don’t make it? We provide them with feedback, believing they should come back to try again. It’s alright to fail until… you don’t. For us, honest and constructive feedback is a must, regardless of how well the process goes for a candidate – they need to actually know what they should work on. This honesty is necessary to establish a partner-to-partner relationship with the candidate. One that is meant to be continued in the future. One of the most important sources of new prospects are also current TSH employees. A good deal of our developers are involved in tech events and other community initiatives so, as a result, they have a lot of developer friends. They are happy to recommend The Software House, because they know they do them a favor. A lot of them will, in fact, get hired, and they themselves will bring in even more interesting candidates. 6. Are you doing something awesome? Tell the world about it! We believe that if you do great things, it’s perfectly fine to be proud of it, even to boast about it. This is why our marketing team makes sure that all of these benefits and initiatives make their way to the local developers community in the form of articles, videos, social media content, memes (they really do like memes!) and whatnot. The same goes for all the recognition we get, such as a spot on the annual list of the fastest growing companies by Financial Times as well as our impressive Clutch record. But remember: it’s good to tell others about your actions only if you really have something to be proud of. So, take care of your employees first – think about marketing it later. I’ve just briefly explained how we make sure that there is a sizeable stream of developers The Software House can draw from. But how to ensure that they don’t leave us? There are a couple aspects to it. At first glance, it might seem that activities such as playing football and video games together, organising running challenges on Endomondo, an ever-growing base of custom emojis and a long-running meme series are not part of your typical job day. But we found out that not only do they not have negative long-term impact on productivity, but also ensure that working at The Software House feels like something more than just a duty. It’s a place where people enjoy themselves – with just the right amount of focus needed to work efficiently. First of all, as a company, we tend to target the most challenging and fascinating projects. We were never the kind of a company that tries to seize every single business opportunity. Once they are on board, we make sure that they know what kind of career opportunities await them at The Software House. Each department has its own requirements for junior, mid and senior positions. They are written in detail and available for all employees to see so that they can work towards a promotion efficiently and at their own pace. While our devs themselves know what needs to be done to earn a promotion, they aren’t left without any help. To make sure that every employee feels like they grow, our heads of departments listen to what they say. Based on that, they can for example change their role in a project, or even assign them to something entirely different. It’s even possible to rotate or completely switch to another department, when one decided to change their technologies of choice. In the long run, it’s beneficial for both them and clients, because only satisfied and motivated developers can provide the level of care we strive for. There are also a lot more, slightly less conventional ways of making sure that our developers can’t complain about lack of challenges. For example, in order to test new technologies, we develop various internal projects such as our HR web and mobile app. Our developers are also encouraged to leverage their creativity by creating content for webinars, meetups, conferences, blog articles and more. And how about taking part in open-source projects led by The Software House? Some of our most popular works include Kakunin, Fogger and Babelsheet. They were all created to solve real software development challenges we face and every developer is welcome to contribute to their continuous improvement. And why not suggest a whole new open-source project for The Software House to back? Not a problem. We even host coding challenges for our developers during which many new ideas are presented. Above all, we want to trust our developers. They are given a lot of space and they themselves participate in creating policies that shape our organisation. For example, our senior developers prepare tasks and take part in job interviews for new prospects. There is no point in running an organisation this big if you don’t trust the people that make its core processes work. You make great things and talk about them in order to draw the attention of developers. You get a solid pool of prospects to choose from and you hire those with the best technical and soft skills. You make interesting projects and provide proper conditions for developers to thrive so that they want to stick around. By doing so, you create even more proof you can use to show potential candidates that this is the right place for them. Like I said in the beginning, while running this cycle is not exactly a piece of cake, the really difficult part is setting it in motion. You need to earn that “first million” somehow. If you think that you can go for it, I encourage you to use our experience to create a great team of developers of your own. Of course, you also need to actually have a business reason for going this far to attract developers. If you don’t believe that it’s the right way for your company, you can also (simultaneously or alternatively) turn to us – a software house which has already done all this job for you – and outsource development to a remote team of qualified, job-satisfied developers. Either way, you’ll end up working with experienced professionals who simply like their job. And in the world of software development it’s the best scenario you can imagine. CEO at The Software House with more than 10 years of experience in building web and mobile apps. But most of all: a gamer, a geek, a good-food lover.